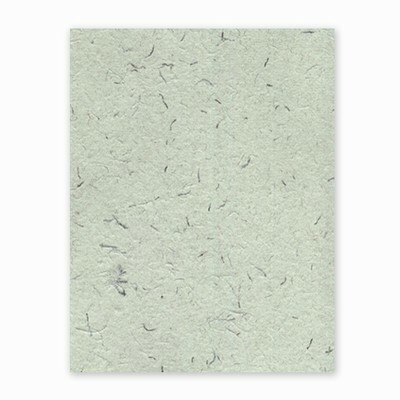 This paper is handcrafted one sheet at a time blending 100% recycled fibers with shredded hemp fabric from Hempy's. The paper is colored using natural earth pigments. The hemp threads create an elegant yet rugged background for this tree-free paper. This paper does not contain seeds. The sheets are 13 x 19 inches with naturally deckled edges straight from the paper maker's hands and are offered in a package of 5 sheets for $19.95. We are now offering the sheets trimmed to 8.5 x 11 inches without the deckle edge in a package of 10 for $21.95. We also offer complete printing services on this paper and will be happy to provide a price quote to print your job.